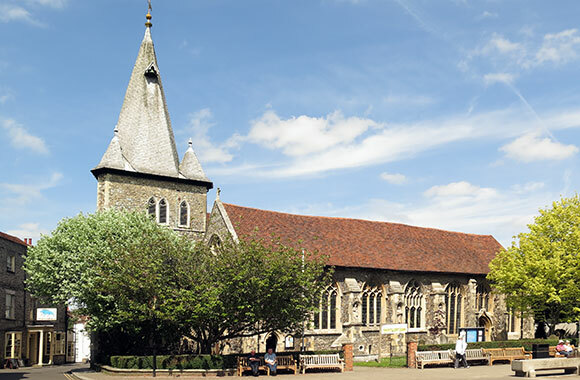 All Saints' Church stands on the highest part of the High Street at the top of the hill on which the ancient part of Maldon is built. The south side of the church, facing the High Street, is especially interesting due to the range of terraced windows, no two of which are quite alike in design. This part of the dates from the fourteenth century and on the buttresses between the windows are modern statues of notable men connected with Maldon: the companion of Augustine, Mellitus who was expelled diocese of London by the heathen East Saxons in 653 and converted them to Christianity; Brithnoth, hero of the famous battle of Maldon; Robert Mantell, founder of Beeleigh Abbey; Sir Robert d'Arcy, who gave the Moot Hall to the town and built the d'Arcy Chapel; and Dr Thomas Plume in the robes of a Cambridge Doctor of Divinity. Above the roof rises the tower, unique in its triangular plan and with a hexagonal spire from which projects a 15th century sanctus bell. This mid-13th century tower is the oldest part of the existing church, but an excavation in the mid 20th century revealing re-used 13th century stones, and the charter of Richard I (1159) prove the existance of an earlier norman church. The church is of absorbing architectural interest, for it has been considerable altered, especially in the 14th, 15th and 18th centuries. The oustanding feature of the interior is the rich wall arcading of the south isle which ranks among the finest work of the 14th ceentury in the county. Immmediately below it is the entrance to the crypt. The south isle was extended eastwards in the 15th century to form the d'Arcy Chapel. The washington window was unveiled in 1928 to the memory of Lawrence Washington, great-great-grandfather of George Washington, first president of the Unites States of America. This was the gift of the citizens of Malden, Massachusetts, which was founded about 1649 by Joseph Hills and others who went out from this Essex town. There are also a number of heraldic ledger slabs and handsome wall-monuments in the church including the memorial in the 15th century North Chapel to Thomas Cammocke (1602) and his two wives. At the rear of the church is the All Saints' Vicarage, a charming timber-framed house which was buit early in the 15th century with a central hall and cross wings. Outside the front of the church is the Memorial Cross to Maldon men who fell during the First World War.